Well, we have been very bad about updating this blog. 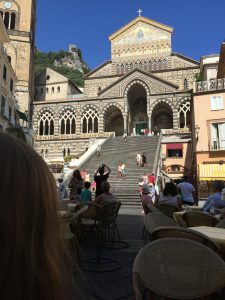 We are having too good a time and just couldn’t seem to find the time to sit down and write something… We are currently weather-bound in Amalfi (high wind gusts and a bit of rain) anchored in 12 meters of water. It was a rolly-polly night as swells came in from the sea and kept the boat in motion. 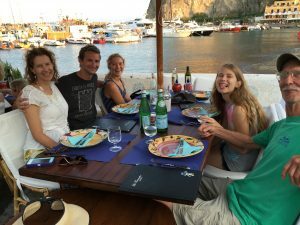 Family (Maryly, Maddy, Helen, Uncle Pete and Cousin Will) arrived on Sunday and on Monday we were off to the island of Ischia and Ischia Castle for a wonderful overnight stay. The Castle is truly spectacular and we spent Tuesday walking everywhere around the Castle and town. Next we were on to Sant Angelo on Tuesday night. This is a favorite town of mine after a stay with Keith and Jeffrey last year and it did not disappoint the second time around. There is just something special about the place. We had a couple wonderful meals and spent a whole day at the Poisedon Hot Springs Spa. Next day it was a 5 hour half sail (no Genoa)with a drive by of Capri (we’ll visit next week) to Sorrento. There was much climbing to be done to reach to top of the town but what a view! Beautiful buildings and LOTS of people. Also ENGLISH was everywhere. 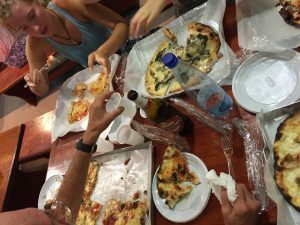 On Ischia we rarely heard english spoken because Ischia is more of an Italian vacation spot and as such is not overrun by…well…people like us. 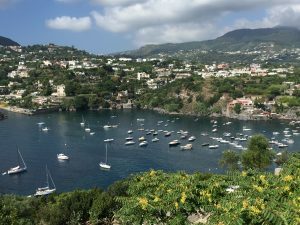 Sorrento is lovely and the view from the boat is the way to see these towns. On Friday we drove around the peninsula to the southern coast of Amafli. 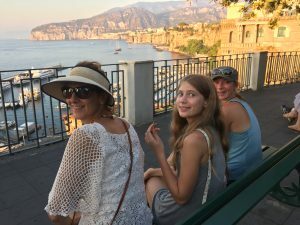 We sailed by Positano and came here to Amalfi. Another great town to visit and view from the sea. Toured the Cathedral and paper making factory (very cool). 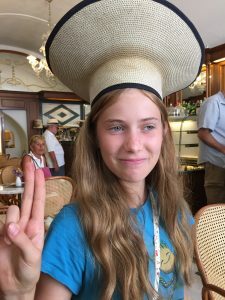 Pope Helen requires a Croisant! So, still in Amafli and life is good. Sure you “Sailed by ” Positano..;-) are you going to “stop by” Positano instead? Capitano? wa, glad to see everything goes well, the bad weather won’t last long, come up to Positano to visit me? the local SITA bus can take you here, no need to sail your boat anyway. Anna, so sorry. The plan was Amalfi and then Positano but the weather has kept us and the boat here. The family has ventured into town again but I have stayed aboard to watch things. 30-40kts winds have anchored boats dragging their anchors around all day. Ugh! We are probably off to Capri tomorrow and will have to save Positano for next week with our new crew. Regards, Dan. Next week to positano will be good, as I told you Aug. 15 here will have big fireworks show on the sea, about 1/2 hr.at midnight,a lot of smoke but beautiful though. I see the sea is getting calm, enjoy your trip to Capri…. Hi Anna, Positano tomorrow, Thursday. Sorry for the last minute update but we are following the wind around the Amalfi coast. Hope to see you if you are at home. Dan. I am home Capitan, I leave my number in messager, make sure to give me a call, welcome to positano. Your descriptions of the places you visit are so wonderful, my list for future travels is getting longer! Thanks Jocelyn, you were always my hero, you know!